The Nigerian defender is without a club after triggering a clause in his contract allowing him to leave Hibs with six months remaining on his current deal, and has been linked with a host of clubs. However, the Championship side remain optimistic that they can lure the 30-year-old to Hillsborough despite interest from the Bluebirds and clubs in Turkey. Turkish Super Lig side Akhisarspor and Orebro of Sweden’s Allsvenskan have been credited with an interest in the centre-back. Ambrose is now considering his options and has already received offers, but is understood to favour a move to England. The Owls are currently without a manager, with Steve Bruce set to take the reins on February 1, but backroom staff Stephen Clemence and Steve Agnew are already working on deals and could make an approach to the ex-Celtic defender. 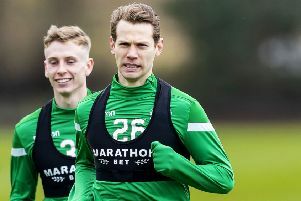 Ambrose made more than 80 appearances for Hibs, initially joining on loan from Celtic and helping the Easter Road side to the Scottish Championship title, before signing a permanent deal as the side finished fourth on their return to the top flight and qualified for Europe. He netted against NSI Runavik and Asteras Tripolis in Hibs’ Europa League run earlier this season.